The trip for the flying dolphins last for one hour and 30 minutes and approximately one hour and 45 minutes for the flying cats. 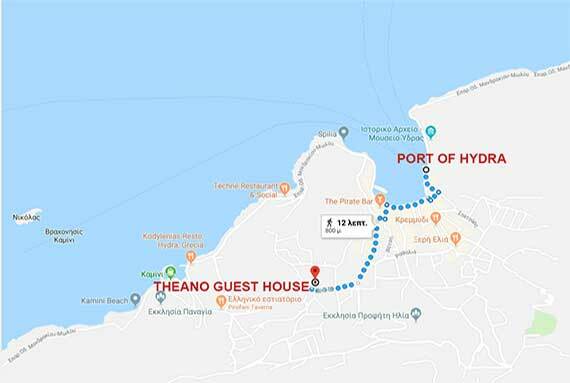 If you own or rent a car, you can easily get from Athens to Hydra in 2 hours and 45 minutes. 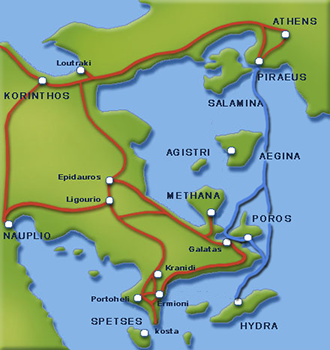 Through Attiki Odos, get on the National Road Athens – Corinth and make a left after the canal heading towards Epidauros (Corinth Exit B - Epidavros). Then, follow the new road, making sure you don’t miss the sign to Poros. At this point, slightly turn left for Poros and you will reach Galata in 30 minutes. You continue on the coastal road and in a half an hour you reach Metochi. Your trip from Athens to Metochi will approximately last 2 hours and 30 minutes. Metochi is a location opposite from Hydra, where there is a free public parking to leave your car and then come across to Hydra with daily departures of the boats "FREEDOM Ι", "FREEDOM ΙΙ" & FREEDOM III that lasts approximately 20 minutes. Also from Metochi area you can reach Hydra island anytime we like also with a sea taxi.